It’s painful but we really must talk about it…those unwanted visitors that keep popping up in your yard. I’m not talking about the in-laws; I’m talking about those gosh-darned, cotton-pickin’, sons-of-a gun weeds. Where did they come from, why do they stay, and why the heck are they growing better than anything else? We often hear complaints, gripes, and frustrated commiserations from homeowners about these very questions. Is the deck really stacked against all of us gardeners? Should we hang up our work gloves, put away the lawnmower and hoes, burn the landscaping magazines, and start writing petunia elegies? Home gardeners, hear my call: the answer is NOT YET! Controlling and eradicating the weeds in your yard is achievable, and surprisingly less work than you might think. Read on for the easiest, cost-effective ways to rid your yard of these unwelcome plants. Chick Weed – Chicks are cute, but chickweed is not a cute garden weed. One of the first weeds to appear in the spring, this annual plant has very small, ovate leaves on prostrate stems. Small white flowers appear a few weeks after germination. Chickweed is able to produce seeds through two different methods according to the weather, so is able to ensure seed production in cool and hot temperatures. Thistle – There are a few different weed thistle species in our area, but all of them feature those terrible, spiny leaves and purple or whitish flower heads. Can you believe these perennial invaders are members of the sunflower family?! Plantain – The name makes you think of bananas, tying to get rid of these things in your yard can make you go bananas. Prostrate, compact leaves form around a central stem. Yellowish flowers on stalks emerge early in spring. Quack Grass – These are the grasses that appear in your lawn and garden that are very broad-leaved. Able to produce via rhizomes or seeds, perennial quack grass is aggressive and spreads quickly. The single-most influential factor in determining whether or not your yard will be prone to this or that weed is determined by the soil. Cultivated garden plants (i.e. the plants you buy at a nursery) tend to like porous soil, high organic content, elevated soil biology (bacteria, mycorrhizal fungi, microscopic insects, annelids, and arthropods), slightly acidic PH, and ample moisture alternated with drying periods. Without a majority of these qualities in your soil profile, your garden plants will not perform to their full potential. The often hard-packed soil, high in clay and alkaline, that we see in our yards can be a challenge for gardeners wanting to get the best from their gardens. Weeds, however, don’t mind this soil composition at all. Invasive plants are so in tune with the soil, in fact, that experts can actually tell what’s in the soil by the plants that are growing in it. Dandelion – Growing in most soil types, dandelions are good indicators of low calcium levels in the soil. Dandelions also thrive in soil that has been recently disturbed without any other competition from nearby plants. Chickweed – This plant thrives in light, cultivated soil. It is indicative of elevated soil levels of potassium and nitrogen, and low levels of phosphate. It is unable to handle drought and thrives in cool, wet conditions. Thistles and Plantain – These plants are members of the C4 plant group, meaning that they have the ability to both conserve C02 and water. They are therefore able to photosynthesize during periods of drought teamed with high heat (compare this to most other plants that have to stop photosynthesizing in high heat as they switch their efforts to conserving moisture.) Growing in multiple soil types, the big adaptation that plantain and thistles have evolved is the ability to grow in saline conditions. Thistles will tolerate about 2% salt content in the soil, and plantain will tolerate a staggering 10%! Now that we know why the invasive plants are popping up in our gardens, the next step is to put that knowledge to use! The best method to eradicating weed problems in your yard is to create a soil environment that is inhospitable to the problem weed. 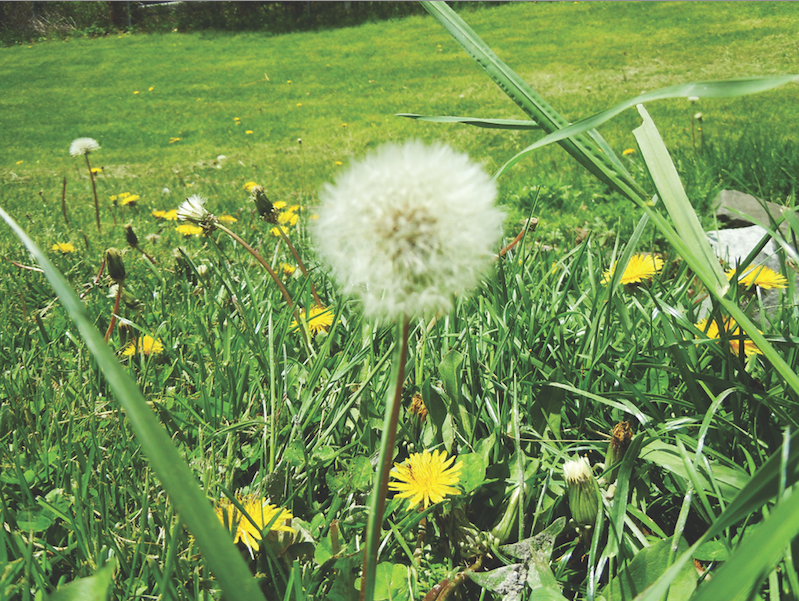 Turf – Have dandelions in your yard? Dig up or spray (with selective herbicide such as Weed B Gone or Killex) as many as you can find and then overseed your lawn with fescue (if shady or dry conditions) or kentucky blue grass (if wet conditions). Be sure to add calcium (bone meal) to your turf fertilizer. Garden Beds – If battling chickweed is driving you crazy, pull as much of it as you can and spray with herbicide like Path Clear or Round Up if necessary (be careful not to spray anything you don’t want to kill) and amend your soil with phosphate. Allow your flowerbeds to dry to a depth of 2″ in between waterings. Be sure to dispose of all weeds that you remove in a garbage bag. Laneways and Parking Pads – The key to controlling weeds in these areas is to try to reduce salinity (i.e. change your road de-icer to one of the more environmentally-friendly products) and increase your vigilance, scouting a couple times a month for new plants. Either pull or spray the invasive weeds (with herbicide), disposing of seed heads in a separate bag. Weeds are a real pain in the gardener’s backside, but they are also great indicators of what is going on in the soil. Rather than viewing these plants as being an indestructible force destined to thwart gardeners’ best efforts, we should exploit weeds for what they are: great opportunities to learn about soil science and improve the condition of the soil in our yards. The bit of labor it takes to remove the initial problem plants and amend your soil is minimal compared to the benefit of watching your garden thrive from finally receiving the nutrients it has been begging for. Let’s all get out and give invasive plants the royal Heave-Hoe (pun intended this time) this spring!